Date: Saturday 17th March, 2007. 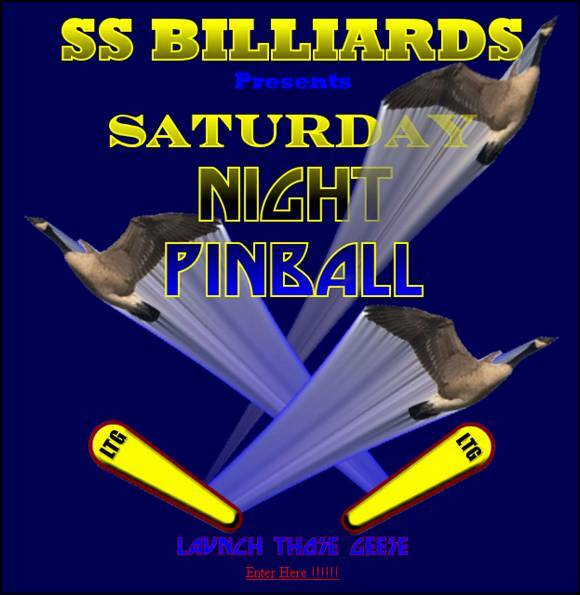 Location: SS Billiards, 732 11th Avenue South , Hopkins , Minnesota , USA . 55343. 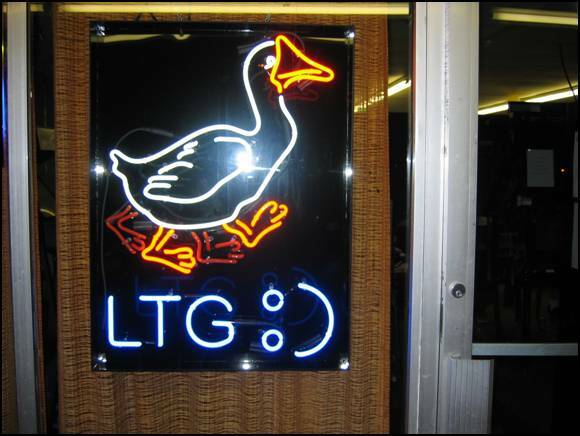 On October 2nd 2004, SS Billiards in Hopkins , MN , USA changed from its Goose themed parties to a customer appreciation party, Pinball Circus. 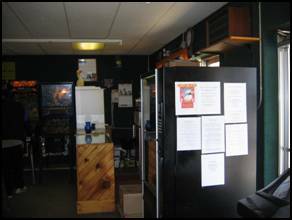 On March 17th 2007 there was another great customer appreciation party. The circus lasted from midday until almost 2:30am the next morning. 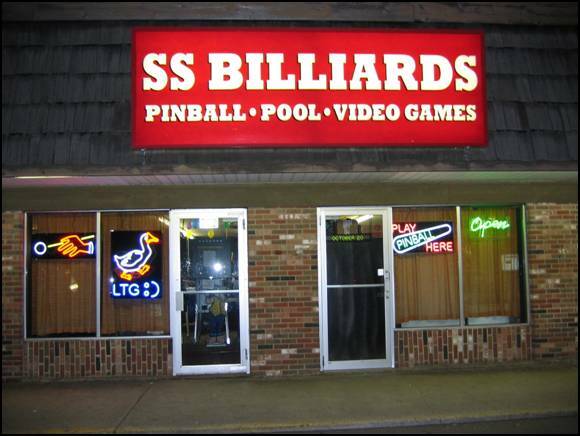 The updated front of the world famous SS Billiards. It's hard to believe that an entire circus fit inside this small suburban arcade. 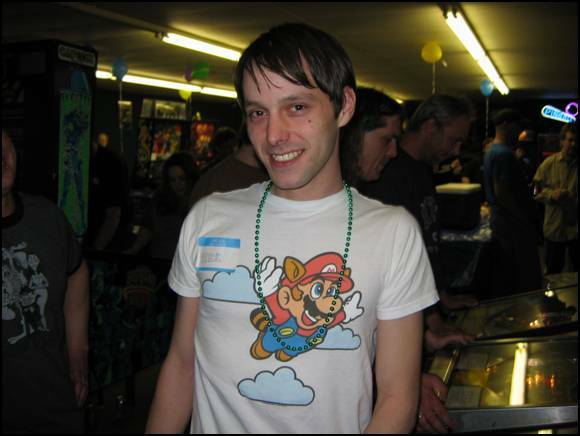 As is always true, Lloyd was solely responsible for: funding, hosting, organizing, and setting up the Pinball Circus. But because this circus once again ended so late, he couldn't do it all by himself. This was especially true for clean up. As always, Lloyd was mindful of the fact that the pinball-centric party would interfere with the plans of his “regular” pool players. 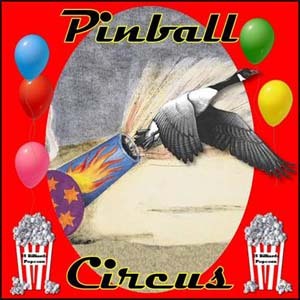 So, to keep the interference to a minimum, Lloyd had to set up for Saturday's Pinball Circus on Friday night, after he closed. 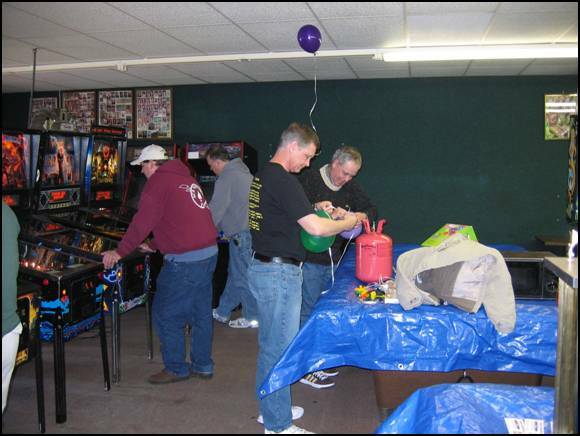 Here you can see Bryan and Curt helping Lloyd fill balloons. Lloyd and others who contributed to the circus came in at about 11am to setup. The circus stared promptly at midday. By the end of the day, over one hundred people attended the circus. Lloyd's regular pinball lineup included: Addams Family Gold, Attack from Mars, Banzai Run, Corvette, Demolition Man, Dracula (WMS), Eight Ball Deluxe LE, Indianapolis 500, Lord of the Rings, Medieval Madness, Monster Bash, NASCAR, No Good Go‘l'phers, Pinball Magic, Safe Cracker, South Park, Tales From The Crypt, Twilight Zone. Additional pinball machines brought in for the circus were: Big Bang Bar. Jason Reufer brought in the Volcano and Black Knight 2000. Vince Birdsley brought in a very nice Terminator 2. Derek Fugate and Tina Curtis brought in the Close Encounters. John Ross and Eric Schmitt brought in the Fish Tales and Fire!. Guest games being set up. Game failures were light. Early on, a tiny wire came off TFTC's left flipper coil. Then, the florescent bulb in BBB went out late. Next, BSD burned up some GI stuff. Indy 500 had a "turbo opto error", very late. As well as the diode; this broke on the right flipper coil of TAFG. And, at the very end of the night, from all of the extensive play, MM had the entire right flipper base come loose. By early afternoon, the party really got rolling! Unlike last year, there were no vendors. But Jason Rufer (A.K.A. MN Pinball) brought in Playfield Rotisseries for sale. 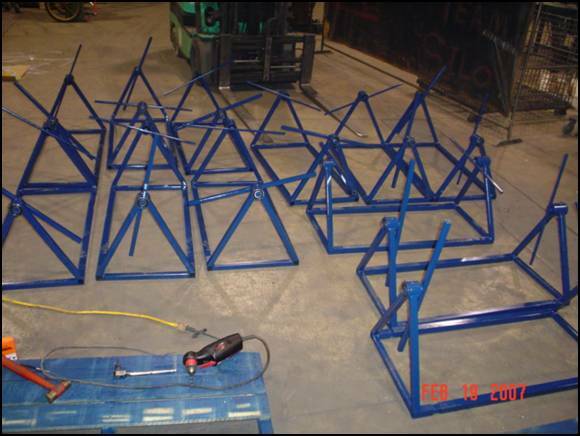 A little behind-the-scenes peak of Playfield Rotisseries. And Bryan Kelly brought in "World Famous Executive PinFooties". 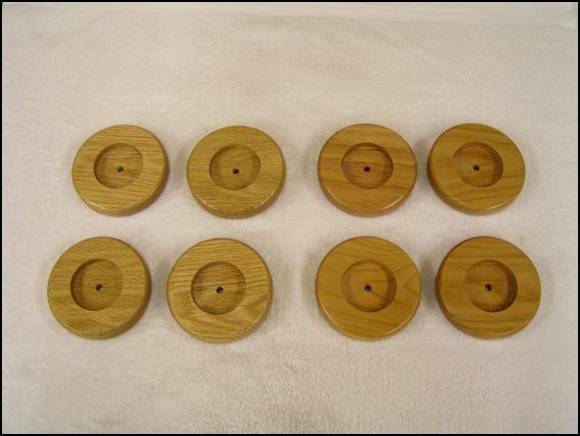 Oak are on the left and cherry on the right. Business cards were put out for Pinball Sales and Neon Images. This was the animated sign that Neon Images had ready just in time for the party. Tickets were normally $20 per person. But, you were only charged $10 if you had already registered for the SS Billiards Player's Card or if were a regular customer. Your ticket gave you: entrance into the arcade, a day of free play on any pinball machine in the room, free food, free drinks, and a chance to win a door prize. Tickets, made by Kevin Pankratz , were only sold the day of the event and were only available at the door. This year marked the first time that Lloyd had a donation box for himself. The purpose of the box was to collect funds towards a "Family Guy" pinball machine. Though several people made donations, Lloyd will not be getting a new pinball machine anytime soon. Lloyd tried to enhance the circus atmosphere with the smells and tastes of fun foods. He offered pizzas with several different toppings and arranged for the pizzas to be delivered from Papa John's about every hour and a half. Lloyd offered pizza, popcorn, hot dogs, and several different choices of soda and Pinball Renaissance provided bottled water. Jason Rufer let Lloyd use his food warmer, to keep the hot dogs nice and toasty. Tina brought two huge bowls of homemade chocolate chip cookies to share with everyone. Greg Kemnitz also brought in homemade cookies. Rich donated our Herr's snacks and gave other support. Due to lack of proper space and low attendance from the last few seminars, there was no seminar this year and plans for additional seminars have been cancelled. Talk Pinball started at 8pm and ran until about 9:45pm. 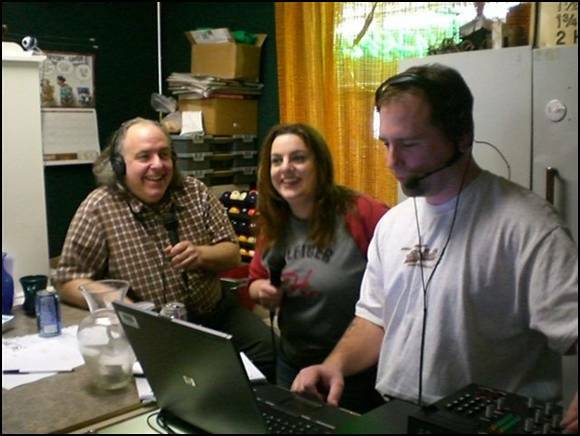 During the course of the radio show, several local pinball collectors from the crowd were interviewed. Besides the normal door prizes, Matt McKee brought in pinball art for the drawings and free apron cards for everyone to enjoy. 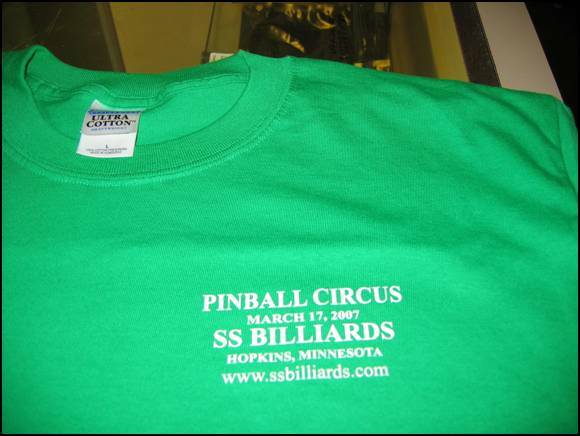 Spring 2007 Pinball Circus shirt. T-Shirts were donated by Jack of Pinball Sales. One of the hats donated by Doug. Lloyd had his usual free drawings for door prizes. Random drawings occurred throughout the day. All one had to do to qualify for a free door prize was to simply join the circus. In order to enter these drawings, circus goers just separated their perforated entry ticket bottom and place it in the jar with the other ticket stubs. Those who attended the circus early had a better chance of winning than those who arrived later. There were several different pinball items available as door prizes at this circus. Doug, from O.C., donated the hats. Marlowe Koch made a contribution towards the mugs. "Captain Jack" of Pinball Sales donated shirts. And Tim Nabours of Nabours Novelty Inc. donated gift certificates. speaker system to announce winners. At one point he announced lucky winning number, "Number 27.....27. Going once, going twice......alright, who the f**k's got number 27." 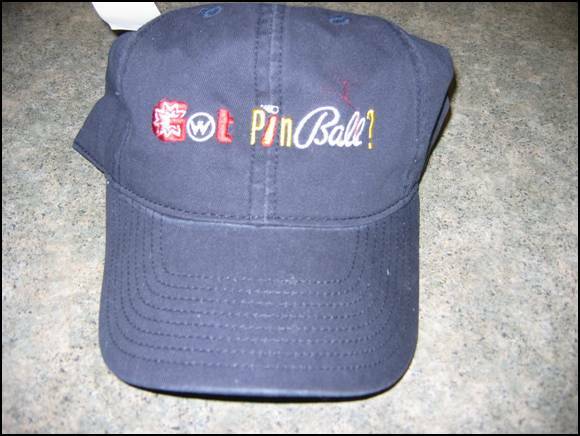 Got Pinball hats - 22, 61, 62, 53. Pinball shirt - 9, 26, 68, 73, 4. Pinball Circus mug - 20, 6, 21, 51, 27, 42, 18, 77, 55, 28, 72, 84, 75, 56, 67. 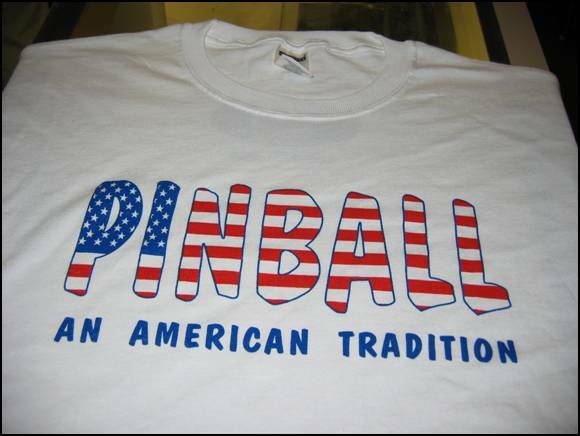 Pinball Circus shirt - 19, 14, 36, 44, 25, 5, 13, 43, 11, 91, 69, 41, 17, 78, 80. Talk Pinball shirt - 83, 4. Pinball Art - 50, 59, 76, 8, 30, 23, 63, 60, 16, 34. Nabours Novelty gift certificates - 31, 10, 15, 85. 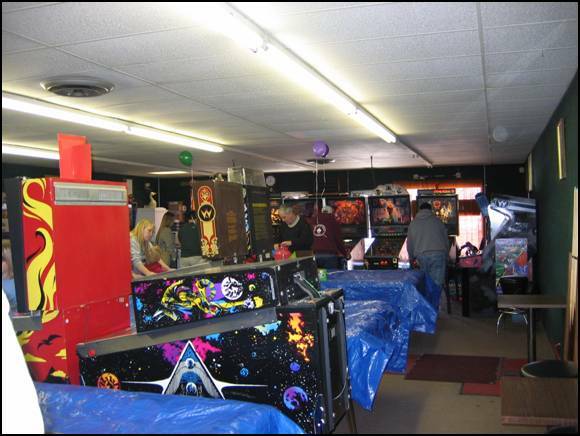 Lloyd held three pinball tournaments at this Pinball Circus. The first to finish was a single elimination tournament. Lloyd held his Saturday Night Pinball competition, the Goose Egg. He also held one-day tournaments on his three ToPS games. Pictured are some of the people warming up for competition. 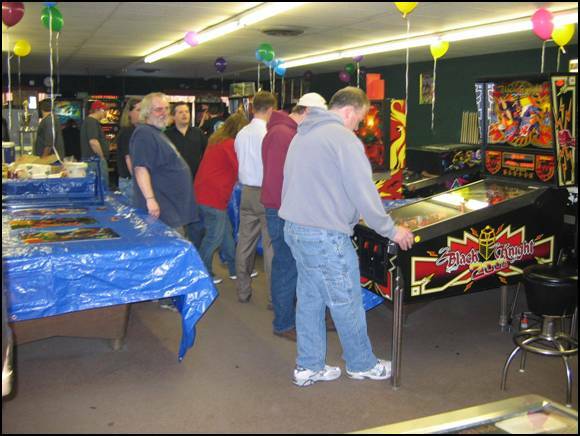 The Saturday Night pinball tournament started at its usual 6pm and ended at about 8pm. 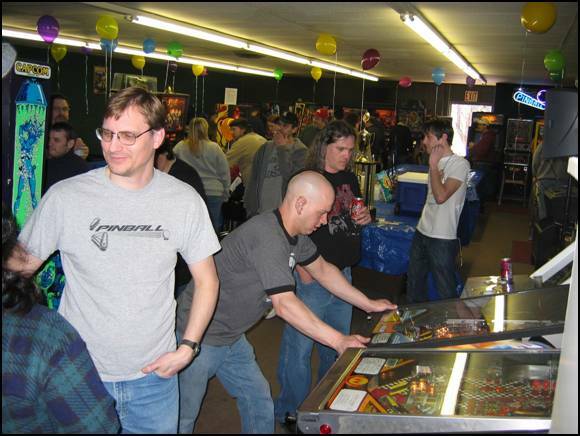 Nick Foss and Terry Webb, with Nick Foss winning the Spring 2007 SNP Single Elimination Pinball Tournament. For his efforts, Nick won $50 and the admiration of his fellow competitors. 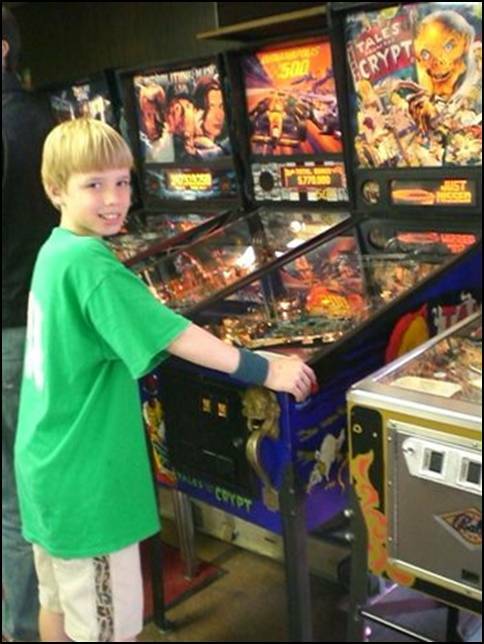 The Spring 2007 SNP Single Elimination Pinball Tournament winner: Nick Foss. Goose Egg was played off on Pinball Magic. The competitors had to play with their hands swapped to the opposing side. So, flipping was really mixed up. Max Harr was the winner with 135,729,140 points. Unlike last year, there was no LMS high score tournament. As is with the seminars, there is no plan to bring back the high score tournament. For NASCAR the winner was Derek Fugate, who won $25. For PotC the winner was also Derek Fugate who won another $25. For Lord of the Rings the winner was Eric Schmitt who won $25. The single elimination pinball tournament was best-two-of-three. 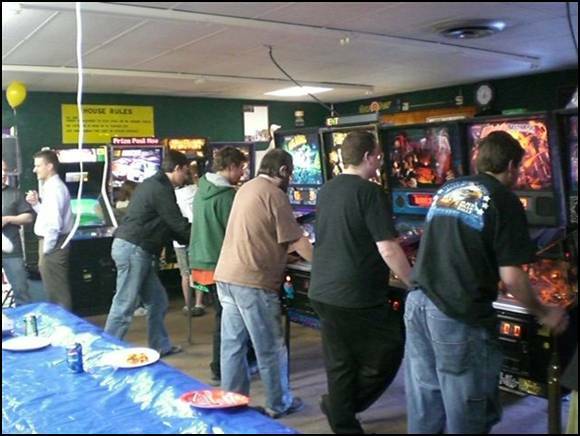 The competition was due to start about 8pm but due to the length the Saturday Night Pinball Tournament ran, the single elimination tournament didn't start until about 9pm. The tournament ended at about 2:30am. Each set of players and games were chosen at random. 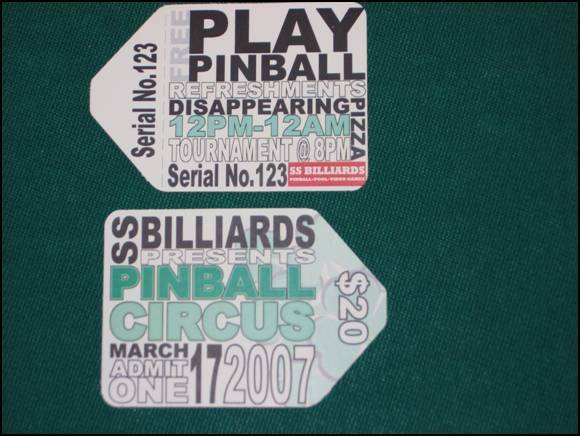 The top few places of the Spring 2007 Pinball Circus Single Elimination Tournament were awarded WPPR points. The pinball tournament proceeded thusly. Terry Webb, Dave Gorka. With Dave Gorka winning. 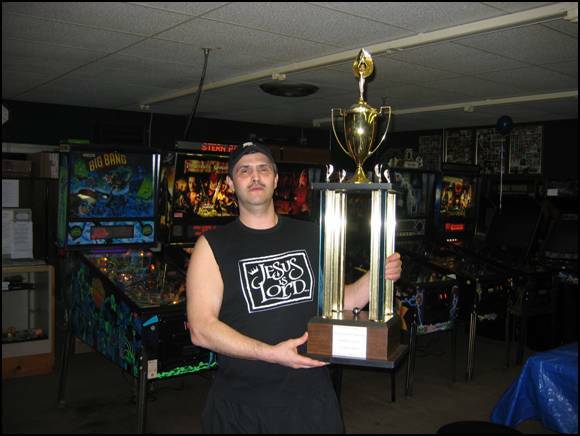 Dave was the winner of last fall's 2006 Pinball Circus Double Elimination tournament, So, this was Dave's second consecutive Pinball Circus win! This latest win also earned Dave WPPR points. At about 2:30 the next morning, Dave finally got his just rewards of $100 cash and a very large trophy.
. Dave proudly shows his very large trophy. Unless noted, most pictures are property of SS Billiards and are used with permission via courtesy of LTG .